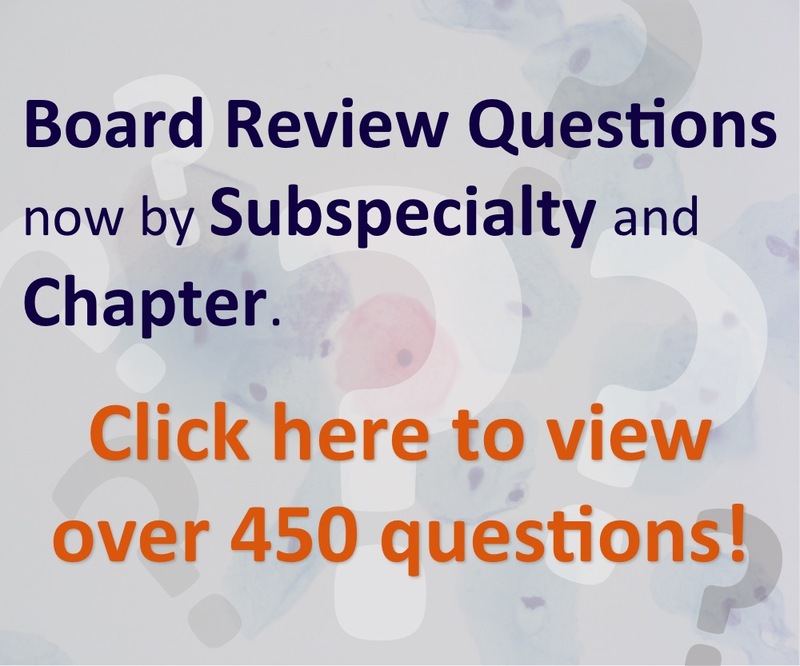 Thanks to Dr. Ankur Sangoi, El Camino Hospital, Mountain View, California (USA) for contributing this case, Dr. Nat Pernick, PathologyOutlines.com for writing the discussion and Dr. Emily Reisenbichler for editorial board review. To contribute a Case of the Week, first make sure that we are currently accepting cases, then follow the guidelines on our main Case of the Week page. (1) We have added a 32nd subspecialty for the Fellowship Page - Cellular Therapy. (2) Each chapter, in the middle of the Table of Contents, has an option for three Superpages - text, images and virtual slides. The Superpages display the entire Chapter contents in one long page, indexed by topic, in alphabetical order. We have now added an enhancement to the Images Superpage so you can select which types of images to appear, such as Gross images or Micro images. Note: you cannot link to the Superpage. It only works if accessed from the Table of Contents. This was done to prevent copyright violations. 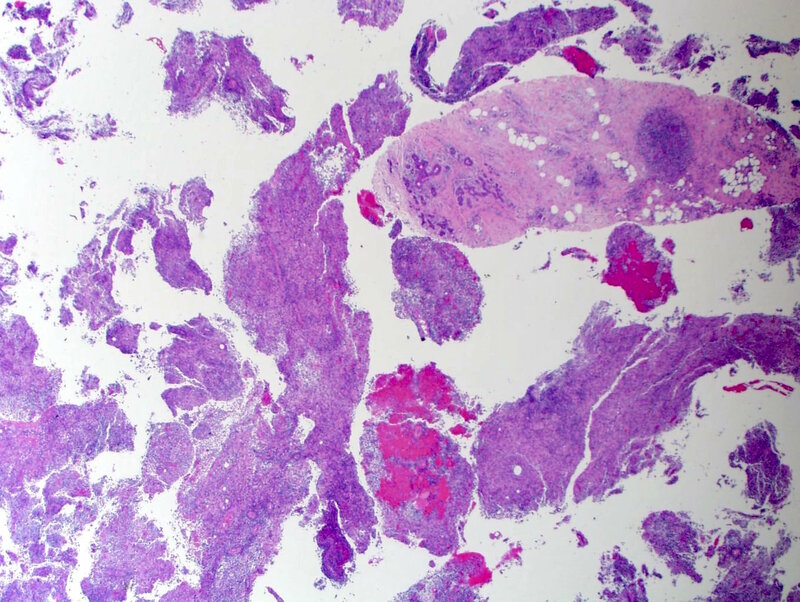 A 30 year old woman, with no significant past medical history or travel history, presented with a breast biopsy for a fluctuant mass-like lesion. Granulomatous lobular mastitis is a rare condition of parous, reproductive aged women which can simulate malignancy based on clinical and imaging features (Am J Surg Pathol 2015;39:1440). 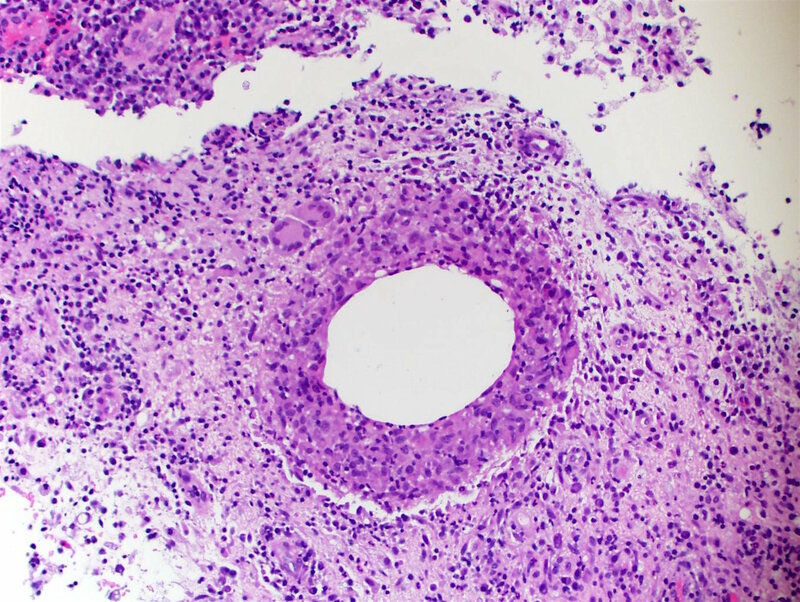 A distinctive histologic pattern, initially described in 2011, is termed cystic neutrophilic granulomatous mastitis (CNGM) and is associated with Corynebacteria infection (Am J Clin Pathol 2011;136:424). In a recent study, affected women had a median age of 34 years (range 25 to 49 years), and all presented with a palpable mass. It was often painful and occasionally was BI-RADS5 (highly suspicious for malignancy by radiology, Am J Surg Pathol 2015;39:1440). 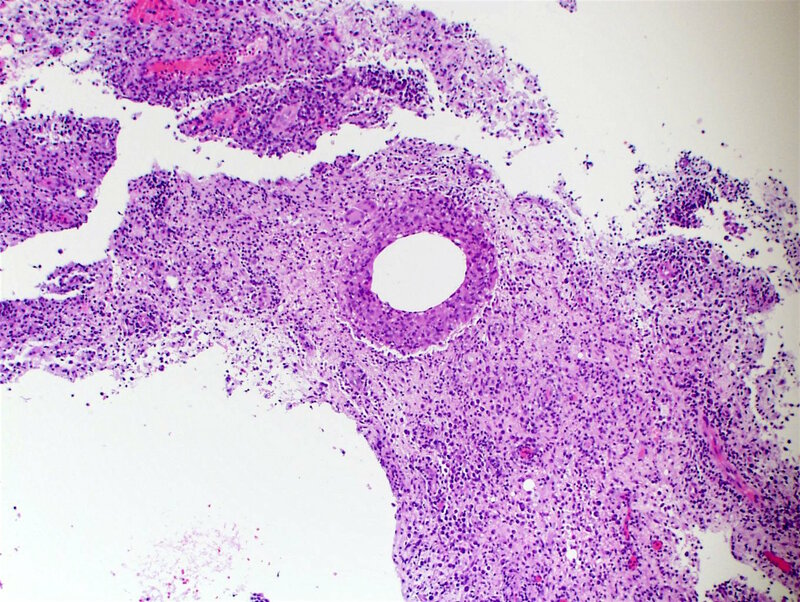 Histologically, CNGM is characterized by lobulocentric granulomas with mixed inflammation and clear vacuoles lined by neutrophils within granulomas. 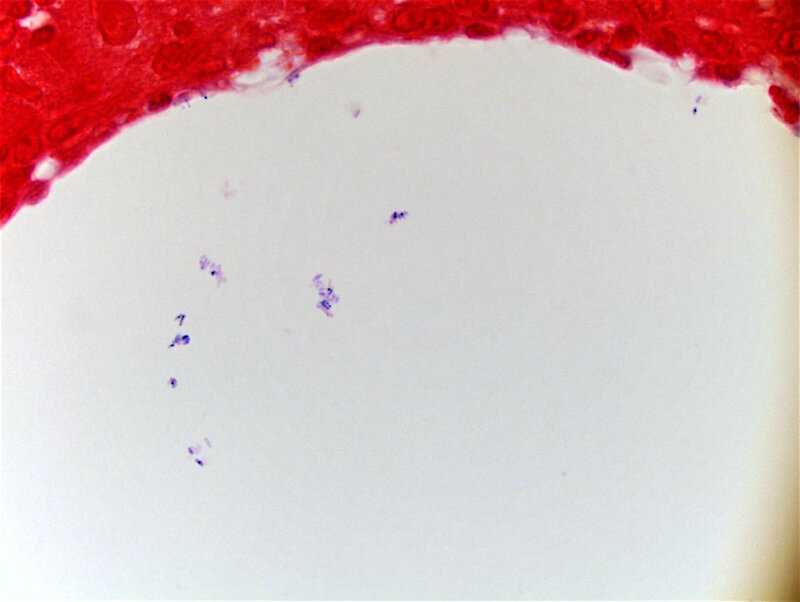 Gram positive bacilli are identified in about half of cases within microcystic spaces (Am J Clin Pathol 2016;145:635). However, diagnosis may require culture, 16S rRNA gene sequencing (Pathology 2017;49:405) or matrix assisted laser desorption ionization–time of flight mass spectrometry (J Clin Microbiol 2016;54:1938). 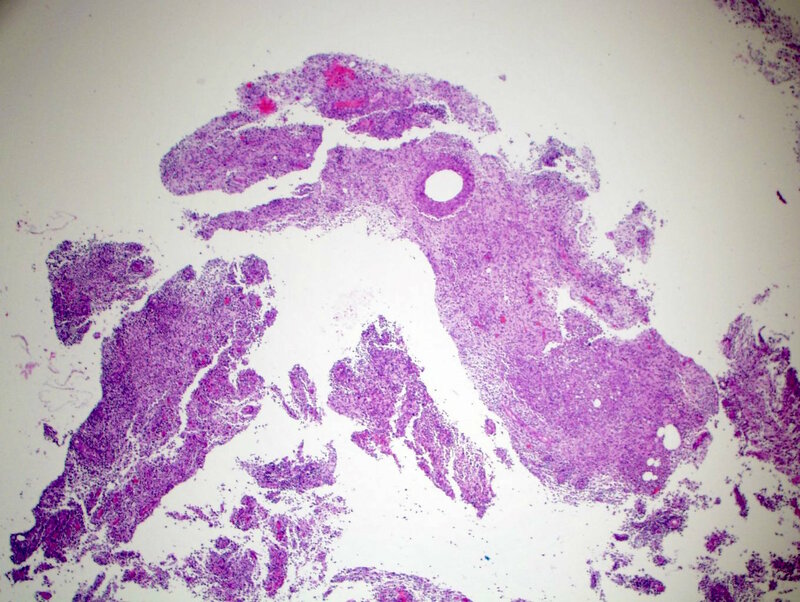 The differential diagnosis includes granulomatous mastitis due to infection (TB, fungi), sarcoidosis, other systemic granulomatous disease or idiopathic (J Pathol Transl Med 2015;49:279). 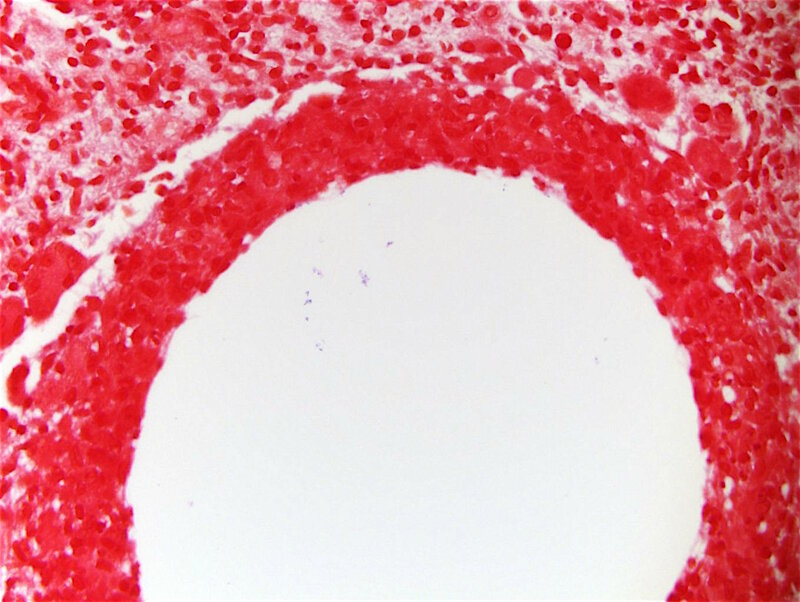 Treatment consists of surgical excision or debridement, lipophilic antibiotics with sensitivity testing (J Clin Microbiol 2015;53:2895) and possibly steroids. Resolution typically takes weeks to months (Am J Surg Pathol 2015;39:1440).